The cantilever projection of the building should not extend beyond the area allotted at any cost. The applicant should first submit their proposal to the department, and accordingly to the concerned departments like R&B, PHE, PDD, Tourism department and Fire Extinguisher department and check the site as per guidelines for construction. The concerned engineer visits the site and submits a reporter to Executive Engineer R&B department which is then forwarded to the Administrator, Municipal committee Leh. On the basis of the report and on fulfilling all the said conditions, the administrator issues permission for the construction. For the construction of government and private buildings, the drawing or the design of the building should be done from a competent authority or from design director Srinagar and Jammu. In cities, for the construction of high rise buildings, modern technology such as crane lifter, batching plant with concrete pumping is used. Construction of a steel building is easier and takes less time. Ladakh region comes under seismic zone and special care is required when it comes to construction of multi-stored buildings. Buildings must be designed by a structured engineer for its safety and security. Department does check the road and land encroachment regularly. All illegal construction is monitored by the District Municipal Committee. In the recent incident that took place in Shey Lamdon School, there was no problem with the structure. It was the solar panels fixed over the C.G.I sheet of the building was not anchored properly and fell down on the aluminum glazed. While constructing a building by some NGOs, the department is not involved in any form. • Water-cement ratio must be maintained while concreting. • All cement work should be made covering at least 20 days or more for proper setting of cement work. • Multi-storey building must be designed by a structural engineer for its safety. • The aggregates should not dissolve in water. Rashid Ahmad, Engineer, B.E. Civil: Ladakh comes under 5th seismic zone and the structure must be built according to the norms. Earlier, the Himalayan region was under zone 4. Now, the region is under a belt 5 after the earthquake in Nepal. So, the region is in the worst prone zone and the place must be structurally sound. The earthquake resistance is incepted in the 50 percent of the commercial buildings but the primary need is the structural designer. It is important to consult a structural designer before the construction of the commercial building. The residential structure can be built on the thumb rule. In some schools and colleges, there is a lack of proper structural designing and many do not consult the department. If such plans are carried through the concerned department, there will be better designing and the same need the VAT by the director design. Such buildings when constructed as per thumb rule that it lacks the proper implementation of the rules. People from other places approaches institute in the form of NGO and sponsors. They start to build without structural designing and do not adhere to any concept and lacks in execution. An engineer is must on the site of the construction to avoid negligence. The government building is properly checked by the departments and in the case of private, there is no proper check and balance. It is also important to build a house as per climatic condition to shield oneself from the tough winter season. In the past, many worst incidents took place due to excessive rain and cloudburst and in most of the cases; the houses were built encroaching river and the streams. Houses must be built by maintaining a gap of at least 20 to 30 feet from the river bank and flood basins. Houses constructed on the hills are not safe with the increase of rainfall every year. There can be sliding and the authorities need to restrict such construction. Also, the designs of the buildings are not as per policy and topography. It is necessary to learn that the building should not be raised beyond three storeys. High rise building is not suitable for the place like Ladakh due to the area being under the seismic zone. The place needs proper structural conceptualizations. Lintel beam is a must for even building a one storey structure. The structure becomes monolithic when there is a combination of lintel beam and column beam. The building or the institute when built with using stones is not as safe as compared to brick. While using stones 3 bond stones must be implemented well after every square foot. In Ladakh, we must adopt a solar passive energy and column structure. Low budget construction is done with the use of mud technology and it becomes eco-friendly. The wall insulation can be done by using the straws or even paper inside the wall. The concept of a wooden floor is unique in itself and indeed better to make the place warm. We need to preserve the culture and heritage. Many hotels are designed keeping all the cultural identification like Rabsal, Yabs, and Shingtsak intact. 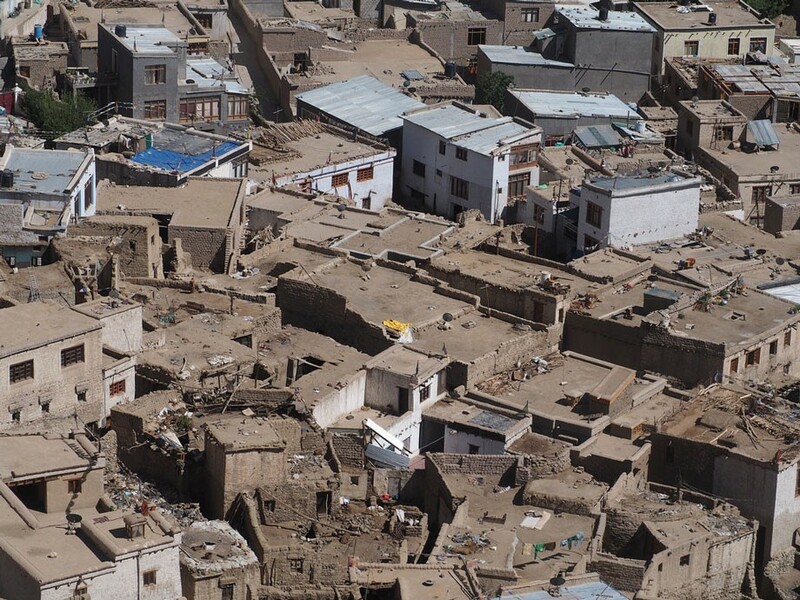 The Ladakhi roof combination of Tallu and Ldungma are getting replaced by Reinforced Cement Concrete (RCC). More local material and technology should be used instead of cement. • Structural designing is a must. • Ladakh should have a proper master plan. • Use of woodwork should be less.